Looking for a chicken burger recipe your family will love? Look no further! 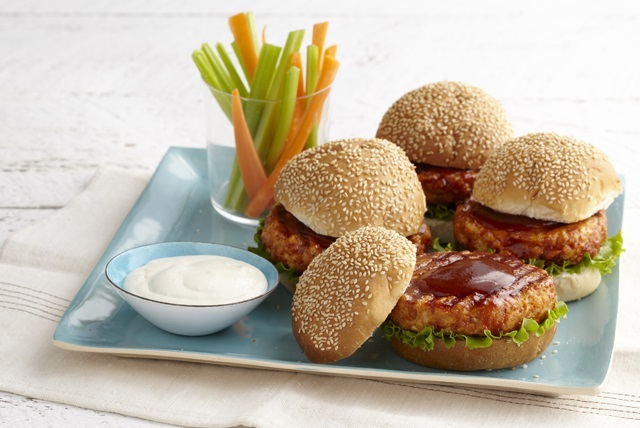 Our Buffalo Chicken Burgers recipe will have everyone going back for seconds. Mix sauces in medium bowl; reserve 2 Tbsp. Add chicken, coating mix and egg to remaining sauce mixture; mix well. Shape into 4 (1/2-inch-thick) patties. Grill 7 to 9 min. on each side or until done (175°F), brushing with reserved sauce mixture for the last 2 min. Fill buns with lettuce and burgers. Serve with remaining ingredients. Prepare using Kraft Chicken'N Rib BBQ Sauce instead of Kraft Original BBQ Sauce. Top with sliced red onion for an extra kick of flavour.